FIRST PICTURES: Pure reveals £100 Chronos iDock Series II | What Hi-Fi? 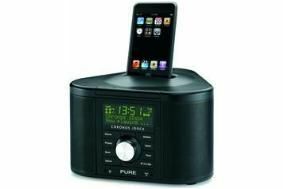 Now we can show you the finished item, which combines a stereo DAB/DAB+/FM clock radio with an iPod/iPhone dock. It gets improved styling, greatly upgraded audio (thanks to a digital amplifier and custom-wound speaker coils), better controls and features including a USB PowerPort able to recharge phones or portable players. Track and 'now playing' information is displayed on the Chronos' screen and users can control their iPhone/iPod via the radio or remote control. You also get four independent alarms, adjustable sleep and snooze timers and a light sensor that automatically dims the display. The Pure Chronos iDock Series II is available now in black or white for £100.